As a cold-weather crop, spinach is reasonably-priced and sweet-tasting now. 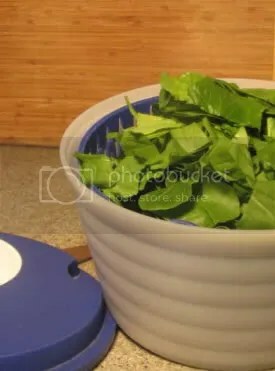 A salad spinner is perfect for washing out all the dirt that collect in spinach. As the star of the meal, this dish requires the most time. So start by preparing all its pieces, but hold off on the last step until everything else is ready to go. Also, take the cheese from the refrigerator now so it can warm to room temperature. Cut into 1-2″ squares, wash and spin very dry. Combine celeriac and lemon juice in a small bowl and toss to coat, then toss with spinach. 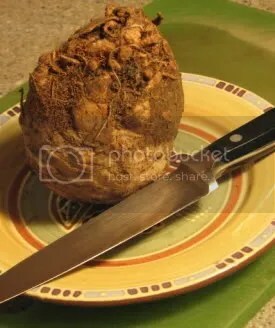 While a tough-looking character, celeriac is also a long-storage vegetable that can be eaten raw for nice, wintertime crunch. Remove the skin by cutting away with a paring or utility knife. Saute onion in 1 Tbsp. olive oil for 3-5 minutes, add pear and saute another 5-7 more minutes until everything is browned. (If using bacon, add and saute 2-3 more minutes to cook through.) Push everything to sides of pan, add a little oil to center of pan and saute garlic just 1-2 minutes. Turn off heat and stir everything together. Deglaze pan with broth, then add vinegar and oil and stir to mix thoroughly. Reserve until serving time. Bosc pears, a winter storage fruit, are best when there is no longer a green hue to their skin and they "give" slightly when pressed gently from the sides. Buy several and store in a paper bag so you always have some of these sweet gems for winter cooking. 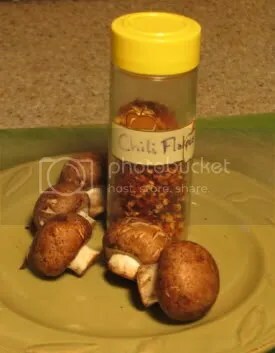 Chili flakes are added only to brighten up the mild taste of mushrooms for winter. So consider sticking to the recommended amounts, even if you’re a chili lover. Saute mushrooms in a large saute pan for 10 to 15 minutes, until browned but not shriveled. Push mushrooms to sides of pan, pour about 1 tsp. olive oil into center of pan and warm slightly. Add chili flakes and cook about 30 seconds. Immediately stir in walnuts and continue cooking about 3-4 minutes, stirring occasionally, until nuts begin to brown and smell toasty. Stir mushrooms and walnuts together, turn heat to lowest setting and keep warm until ready to serve. This idea came via a comment on last month’s parsley article, where Jill Swenson shared another great use for parsley: her favorite creamed cheese and parsley sandwich. Since I can’t eat cow milk products, I substituted sheep milk chevre (from Sunny Breeze, a family farm in Craig, Colorado, sold at Vitamin Cottage). Goat milk chevre would also work. Because of their bold flavor, very little is needed. Chili flakes are added only to brighten up the mild taste of mushrooms for winter. So consider sticking to the recommended amounts, even if you're a chili lover. Combine cheese and mustard in a small mixing bowl and mash and blend with a large fork to combine, adding soy milk as needed to make a spreadable mixture. (It helps if the cheese can be left at room temperature for an hour or so.) Stir in parsley and add salt and pepper or more mustard and/or parsley, to taste. Serve bowl of spread on a tray, surrounded by toasts and small bowls of additional parsley and mustard to use as desired. Read more about Superfood Parsley and check out the easy recipe for Parsley Pesto. Learn how to quickly and easily make meals like this. 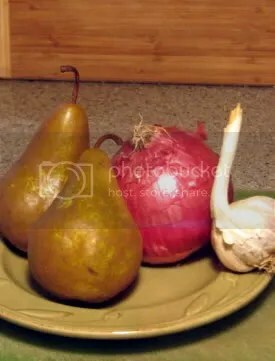 Learn basic cooking techniques like saute and deglaze, and also how to use new and different ingredients like chevre and bosc pears. There’s all this and more in Whole Kitchen cooking classes. New classes are starting soon. Since white bread products have little nutritional value, be sure to use a 100% (or at least partially) whole grain bread. 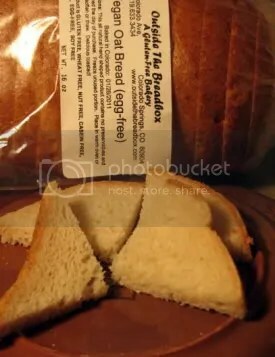 We used gluten-free Vegan Oat Bread from Colorado Springs- based Outside the Breadbox, found at Vitamin Cottage. Note how they are cut in triangles for a little flair. Doesn’t that pear & spinach salad sound marvelous! I’m hooked. Keep your eye out–there’s another spinach salad coming up in the next batch of posts! And love all the spinach that’s coming into season now. It’s sweet and perfect. I’ve had a great spinach salad with maced strawberries and a balsamic dressing that makes for a hot spring day treat. Spinah isn’t just for Popeye and Superman.